A Knocked out Panzerkampfwagen Panther ausf G, commanded by Untersturmfuhrer Teichert from the 4th Company of the 1st Abteilung (Battalion), 12th SS Panzer Regiment, 12th SS Panzer Division "Hitlerjugend" outside 75 Rue de Bayeux in Bretteville-l'Orgueilleuse. The suspension has failed in the fire and the tank has settled to the ground. On the night of June 8-9, 1944, the 1st Abteilung and the 25th Panzergrenadier Regument made an attack on the 1st Battalion, The Regina Rifle Regiment, 3rd Canadian Division, with twenty-two panthers under SS-Obersturmbannfuhrer Max Wunsche, two batteries of self-propelled artillery and a motorcycle company led by SS-Oberfuhrer (later SS-Brigadefuhrer) Kurt "Panzer" Meyer. The Reginas had suffered heavy casualties in the landing on Juno Beach on June 6, but with reinforcements moved towards Caen and occupied Bretteville-l'Orgueilleuse, Norrey, and Cardonville; other Canadian units occupied other towns, including Putot. The 12th SS "Hitlerjugend" Division was made up of sixteen- and seventeen-year-old Hitler Youth and commanded by SS-Brigadefuhrer Fritz Witt. Witt received orders to drive the Canadians into the sea. Meyer expected the Canadians to falter under a concentrated armored attack, a successful tactic on the Eastern Front. At 1100 Hours the attack began. Lacking heavy anti-tank weapons, the Reginas had to stop the Panthers with 6-pounder 57mm (2.24 inch) guns and Projector, Infantry, Anti Tank (PIAT), a spigot mortar with a 12 pound (5 kilogram) high explosive anti-tank (HEAT) shaped charge; the 6-pounders and the PIATs could only penetrate the lesser rear armor of the Panthers. The Reginas also had a large quantity of small arms and aummunition. One PIAT team - Rifleman Joseph E. LaPointe, Rifleman Gill A. Carnie and Lance Corporal Clarence V. Hewitt - took up a position 15 yards (14 meters) from the Regina Rifles Headquarters near Bretteville-l'Orgueilleuse's Church. The flaw in Meyer's plan was that his units, having just arrived at the front, lacked coordination with other attacking Hitlerjugend elements; he also sent his Panthers without much infantry down the Rue de Bayeux, allowing the Reginas to deal with them one at a time. The Reginas claimed twelve Panthers were destroyed; Meyer would only later admit to six lost. The Panther in this photo closed to within 30 yards (27 meters) of the Regina's Headquarters at 0000 Hours; LaPointe, exposing himself to the tank's machine gun fire, struck the Panther with repeated PIAT hits. The Panther, attempting to escape, hit an improvised mine of 75 grenades. LaPointe received the Military Medal. A second Panther, seeing the first explode, fired wildly but only struck the first Panther, fracturing the rear of the turret. The crew of the stricken Panther bailed out and were shot down by the Canadians. Meyer was able to reclaim the nearby town of Putot from the Winnepeg Rifles, but the Reginas held Bretteville-l'Orgueilleuse throughout the campaign for Caen. Witt was killed on June 14 in a naval bombardment. 12th SS Panzer Division Hitlerjugend ceased to exist during the Normandy campaign; some 1,500 of their 21,500 officers and men were killed, wounded or captured by September 1. Kurt Meyer was captured on September 6, 1944 and after the war was tried for the war crime of killing thirty-seven Canadian prisoners at the Abbey Ardennes on June 7, the day before the battle for Bretteville-l'Orgueilleuse. Canadians were outraged that he was given only nine years in prison. Max Wunsche was captured on August 20 after driving a German vehicle through the liberated town of St. Lambert. 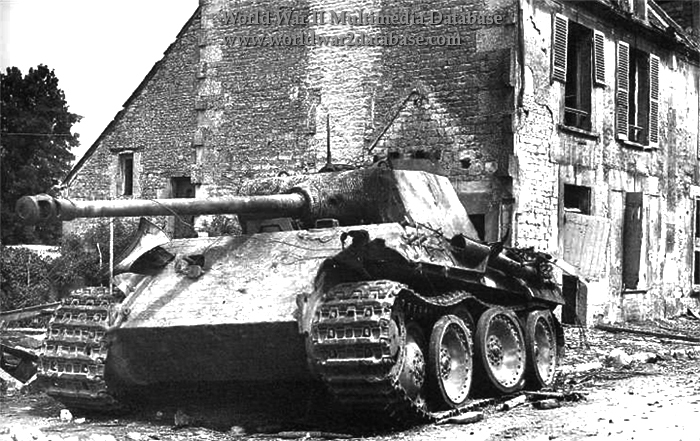 This Panther was the first to be knocked out in ground combat in the Normandy campaign.